1.Brand New and High Quality LED bulbs. 2.Build-in canbus system, error free. 3.Easy to install, just plug & play. 4.Low power consumption, save your energy and power. 5.Life expectancy up to 50,000 hours. 6.Immediate response and vibration resistant, 1000 times faster than traditional lights. 7.Stable and high quality componements make it applicable for most America and foreign vehicles. Before you buy, please make sure this is the correct application type of bulb. Make sure the length of this bulb is suitable for your car. Any neutral feedback or negative feedback, pls tell us frist. Our after-sale service will try best to help you and provide you the best solution to solve problems. 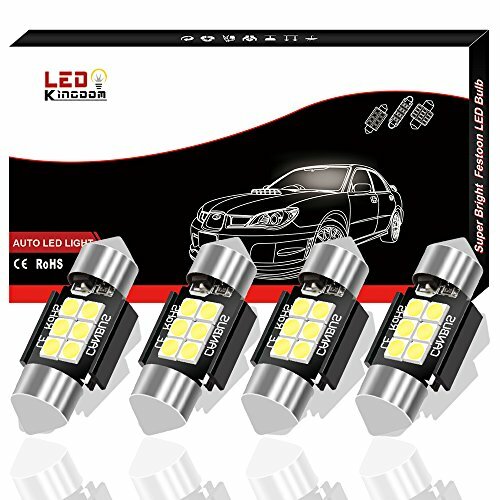 【36mm Festoon LED Bulbs】LEDKINGDOMUS 36mm 6418 LED Bulbs pack of 4, each bulb uses 3030 super bright 6 SMD chipsets. Build-in CANBUS driver to pass by error check. 【Advantages】The 6418 LED Bulb is made with aluminum body design for better heat dissipation, low temperature, low power consumption, life span up to 50,000 hours on your vehicle. 【Cross Reference】3021 DE3021 6411 6413 6418 DE3423 DE3425 etc.Easy to plug & play installation. 【ATTENTION】Our festoon LED bulbs are build in CANBUS ERROR FREE system, but NOT fit for all the European Vehicle, like AUDI. If there are some problem with the bulbs, please contact us, we will try our best to help you. If you have any questions about this product by LEDKINGDOMUS, contact us by completing and submitting the form below. If you are looking for a specif part number, please include it with your message.